ABC journalist David Wright on Friday derided John McCain's attacks against Barack Obama as a "fear and loathing strategy" that "seems to be working among some voters." Reporting on the two presidential candidates and their economic plans, the liberal reporter also highlighted an exchange between McCain and a supporter where the Republican asserted that Obama was a decent man who just has bad ideas. Contrasting the remark with past McCain attacks and ads, Wright huffed that this might be an example of the candidate "realizing, perhaps, that Americans already have enough to be afraid of." Friday capped off a week of David Wright aggressively criticizing the Arizona senator. On Thursday's "Good Morning America," he hyperbolically complained that the McCain campaign has suggested Obama is "yellow, disloyal and doesn't belong." Wright also darkly intoned, "But in the past couple of days, the Republicans have been laying it on thick. Chumming the waters. And, not surprisingly, ugly reactions are beginning to surface." On October 7, just two days earlier and again on GMA, Wright discussed how both campaigns were trading shots over Obama's association to former radical and terrorist bomber William Ayers. At the same time, the Democrat had launched a new campaign spot on McCain and the Keating Five savings and loan scandal. Wright seriously wondered, "Which is worse, a radical terrorist who wanted to blow up the Pentagon 40 years ago or a crooked banker whose failed savings and loan had to be bailed out by the taxpayers 20 years ago?" TERRY MORAN: The financial crisis has taken center stage in this the home stretch in the presidential election, but the candidate's approaches have been in stark contrast. Barack Obama, riding the momentum on this issue so far, has tried to show a steady hand. Now, John McCain, well, he's gone on the attack and his supporters have taken the cue with a vengeance. But today, that dynamic between McCain and his angry crowds took a dramatic turn as David Wright reports in tonight's "Trail Mix". SENATOR BARACK OBAMA We meet at a moment of great uncertainty for America. WRIGHT: -there's no changing the subject now. SENATOR JOHN MCCAIN: We are in the greatest financial crisis in our lifetime. WRIGHT: One issue is front and center of two very different approaches. Barack Obama is trying to project calm in the storm. OBAMA: So now is not the time for fear. Now is not the time for panic. Now is not the time to turn Americans against each other. Now is the time for resolve and steady leadership. WRIGHT: John McCain is all about urgency. MCCAIN: And the question is who's ready to lead? Who's ready to lead in a time of trouble and danger for our country? WRIGHT: They each have their policy proposals. Today, McCain touted his plan to spend $300 billion, nearly half the bailout money, refinancing troubled home mortgages at more affordable rates. MCCAIN: As long as home values continue to decline, then we're not going to turn this economy around. WRIGHT: Today, Obama proposed small business assistance grants. Along the lines of the loans the government often gives out in the wake of hurricanes and other natural disasters. OBAMA: Main Street needs relief and you need it now. WRIGHT: Each of them tinkering around the edges of the plan taking shape in Washington. ANNE MATHIAS (DIRECTOR OF POLICY RESEARCH, STANFORD GROUP): They're trying to stake their claim while at the same time not say, oh, this what we have done is a bad idea because that could have negative repercussions to the marketplace and to individual investors like you and me. WRIGHT: But they each have their gut level pitches as well. More than any one policy proposal, what McCain's offering here to fix the economy is an argument about character that he alone has the independence and integrity to get it done. And there's a corollary to that, that his opponent can't be trusted. TODD HARRIS (REPUBLICAN STRATEGIST): It's a little bit of a bank shot, because what the campaign is saying is Barack Obama can't be trusted, number one. And because he can't be trusted he certainly can't be trusted to fix the economic mess that we're in. WRIGHT: For Obama, the gut-level appeal is that John McCain is just more of the same. OBAMA: It is time to turn the page on eight years of economic policies that put Wall Street before Main Street, but ended up hurting both. MCCAIN AD: Obama. Blind ambition, bad judgment. WRIGHT: Today the McCain campaign fired off one campaign ad. MCCAIN AD: In crisis, we need leadership. Not bad judgment. OBAMA AD: John McCain admits if the election's about the economy he's going to lose. WRIGHT: Obama responded in kind. OBAMA AD: With no plan to fix our economy, smears are all McCain has left. VOTER (FEMALE): I can't trust Obama. WRIGHT: McCain's fear and loathing strategy seems to be working among some voters. WRIGHT: Tonight, at a town hall meeting here in Minnesota, at least half a dozen supporters urged him to attack even harder. SECOND VOTER (MALE): There is a time for fighting. THIRD VOTER (MALE): We would like you to remain a true American hero. We want you to fight. FOURTH VOTER (MALE): We want to know is when you're going to sic a hound dog such as Rudy Giuliani as your attorney general on him and set some political blood in this place. FIFTH VOTER (MALE): Frankly we're scared. We're scared of an Obama presidency and I'll tell you why. I'm concerned about, you know, someone that, you know, cohorts with domestic terrorists such as Ayers. WRIGHT: But McCain backed down. WRIGHT: Realizing, perhaps, that Americans already have enough to be afraid of. 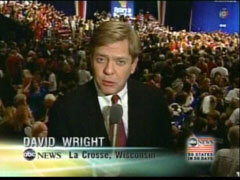 I'm David Wright for "Nightline" in Minneapolis. MORAN: A fascinating moment there. Enough was enough for John McCain. At least for today.